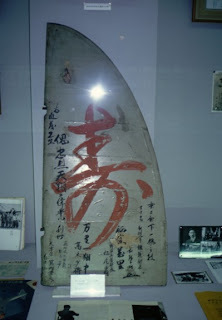 Owaki-san notes that this example is doubtful because the kanji characters painted on the rudder refer to a Navy unit at Otsu air base on Lake Biwa north of Kyoto. This base was associated with Navy seaplane training - maybe the rudder was from an Army Type 97 fighter- trainer that crashed or force-landed there? In 1970 Dr Izawa commented "Some Type 97 fighter-trainers that had their spats removed were painted in a cream-gray". Is there any more information regarding Ki.27 trainers in the cream-gray color, as described by Dr. Izawa? I seem to remember reading somewhere of a report of Ki.27s finished in two shades of gray, and so observed on the same airfield. If the reported cream-gray color were associated with training planes, perhaps other types used as trainers were also finished in this cream-gray color?